will prove of use.This program works in medium and high screen resolutions. 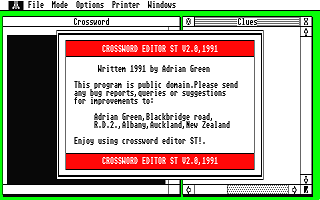 When you first load the program,it will automatically be in this mode. 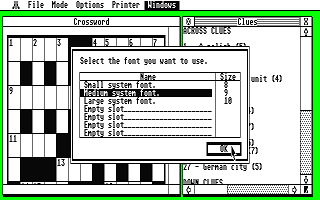 in create mode you enter solve mode by choosing SOLVE from the MODE menu. 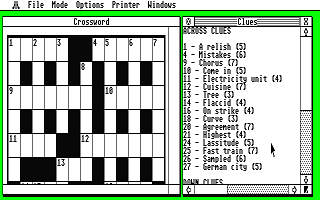 unfinished solution to a crossword using the SAVE SOLUTIONS option. NEW SIZE from the OPTIONS menu. entered into the crossword otherwise you will be asked to change it. entered once,you cannot incorrectly overwrite words etc. in a WYSIWYG fashion. (See help files). drivers that print quadruple density graphics(240 dpi). front of them(just like on the MAC!! ).